It was heartening and reaffirming to see such a high turnout on this week’s ride. Thank you to everyone that came out. There were 13 of us, including three who joined us at various points on our outward leg: how good it is to spot a lone cyclist ahead and realise it’s not some unattached saddo but one of our own. My average speed from home to South Park to the Bearhurst Lane - Pexhill interchange: an on-target 15.0 mph, data that I have no doubt will be pored over by future food historians as yet unborn, seeking to correlate average speed with café calories consumed. In the interests of complete transparency and academic rigour I am therefore honour bound to record that my 5.30 am breakfast had been calibrated to the gram by my personal nutritionist the terrific Miss Cal O’ Riffick in the full knowledge that on our last winter voyage to Red House Farm, a veritable oasis in the wastelands East of Warrington, I and, if I recall correctly, several of my fellow travellers had been enjoyed the performance-enhancing effects of the establishment’s own artisan version of beans on toast. Clockwise from front: Mike. David, Carl, Phil, welcome to Jochen out for the first time with us and who must have enjoyed it as he joined the club within hours of getting home, Steve, welcome back Benet, Simon, Janet, me, welcome to the Lark Ride Richard, Andrew and Mark. 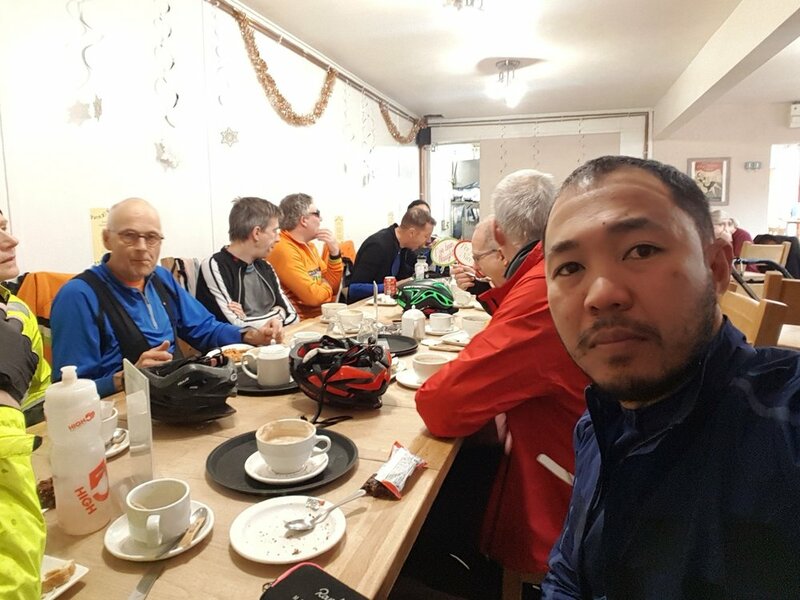 Sat 1pm club run to Minsulls Garden Centre - 1st Dec.